An all-solid-wood entry-level 000 with an ultra-thin finish for extra resonance. 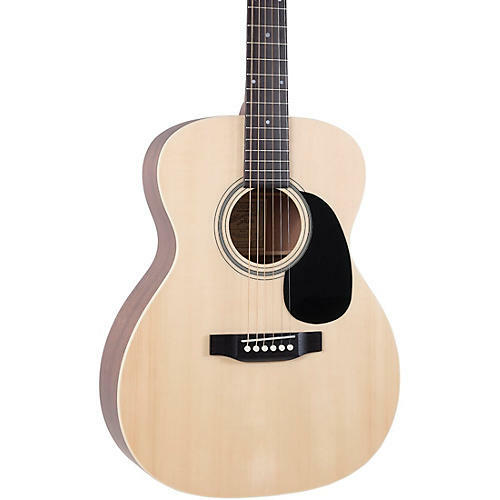 Step into tone with Recording King's M9M Series, like this RO-M9M 000 all-solid acoustic guitar. Serious players have known for years the sonic difference between a guitar made entirely of all solid woods (solid top, back and sides) compared to a laminated guitar, and the M9M Series can be your entry point into world-class sound. The RO-M9M 000 combines a solid spruce top with solid mahogany back and sides, and adds a bone nut and saddle and D'Addario strings. All of these have been combined on the RO-M9M 000, which was built with tone in mind. Every resonant point was carefully chosen to bring an excellent-sounding guitar at an unheard of price. Recording King gave the M9M a thin satin finish that allows maximum vibration from the hand-picked tonewoods and complements the stripped-down aesthetic. Put this RO-M9M into your cart now for hours of enjoyment later.